Over the past weekend, six educators from countries in the Euro-Mediterranean region came together in Beirut, Lebanon to continue their work to develop learning activities that help young people acquire skills for intercultural citizenship. Within the project “Learning about (Y)our Past: History Lessons for Intercultural Citizenship in the Euro-Med region”, a team of trainers, coordinators and authors work on implementing the recommendations presented in “On a Common Path”. The team of authors is supported by Michael Riley (editor of the Guidebook for History Textbooks Authors “On a Common Path” and director of Schools History Project) and long-time textbook author and SHP fellow Jamie Byrom. The project constitutes the first time for EUROCLIO to develop educational resources in Arabic, as well as Greek. This second project meeting was organised by EUROCLIO in cooperation with the Lebanese Association for History. During the first meeting in Nicosia, Cyprus, authors were asked to prepare a list of topics that they would like to focus on in their work. Besides that, the authors were familiarised with a framework and method for developing educational materials. As a result of the first meeting, the six learning activities touch upon a range of issues and topics. These topics are the Lebanese Civil War (1975-1990), national museums of history, encounters through food across the Euro-Mediterranean, the migrations of 1923 between Turkey and Greece, the Israeli-Palestinian conflict, and the Golden Age in 10th century Baghdad. In Beirut, the programme focused on the collaborative process of developing transnational educational materials. After presentations by the trainers and feedback on the progress made since the first project meeting in Cyprus, authors focused on improving their enquiry questions, the end product for each activity and the steps or lessons that enable pupils to formulate answers to the enquiry question posed in the first step. 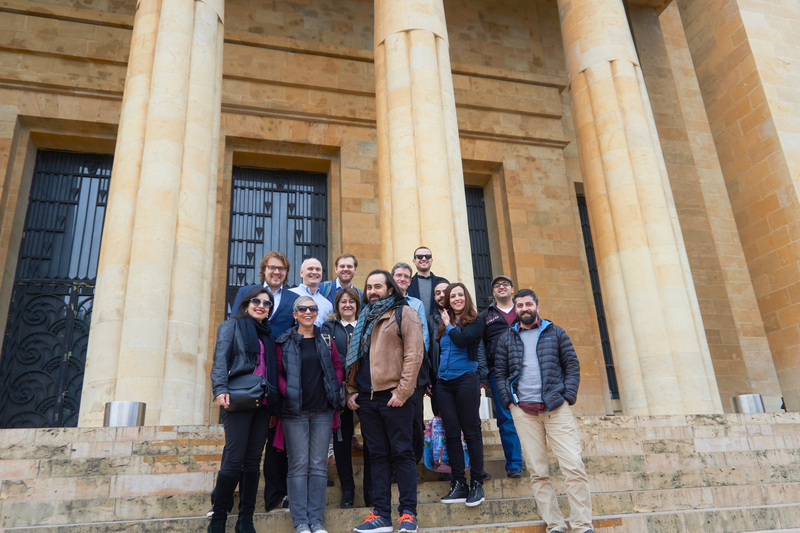 On Sunday, the Lebanese Association for History organised a visit to the Lebanese National Museum, known for its collection of artefacts from Roman, Greek, and Phoenician times, as well as a tour around downtown Beirut. Over the coming months, each author will produce and pilot one learning activity consisting of several lessons. In May, a third meeting will be organised during which the authors present their materials and pilot them with their peers. Following the editing process, all educational materials will be made available on Historiana (in English) as well as translated into Arabic, Greek and Turkish. EUROCLIO implements the “Learning about (Y)our Past” project in partnership with the member organisations Association for Historical Dialogue and Research (Cyprus) and the Lebanese Association for History. The project is funded by the Anna Lindh Foundation, and runs until September 2017. For more information on this project, please visit our project page.